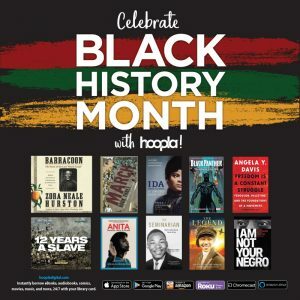 Black History Month on hoopla! Recognize, relive, and share the achievements of African Americans through curated collections in audiobooks, eBooks, comics, video, and music on hoopla digital in honor of Black History Month! Click one of the links below for curated contented related to Black History Month on hoopla! Hoopla digital offers streaming movies, TV shows, and music, in addition to eBooks, audiobooks, and comics. Hoopla is FREE with your library card, there’s no wait list, and you can stream it on your AppleTV, fireTV, Roku, Android TV, Chromecast, or device!